Well here we are on a Tuesday. I am ALWAYS in need of something to inspire me, so when I saw this precious digital image, I knew I would need it in my arsenal. 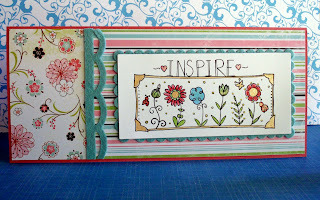 The image is from The Stamping Boutique. What I love about digital stampsis the ability so size them as needed. I colored the flowers using a combination of Copic markers and Copic Spica glitter pens. I used three dies on this card. 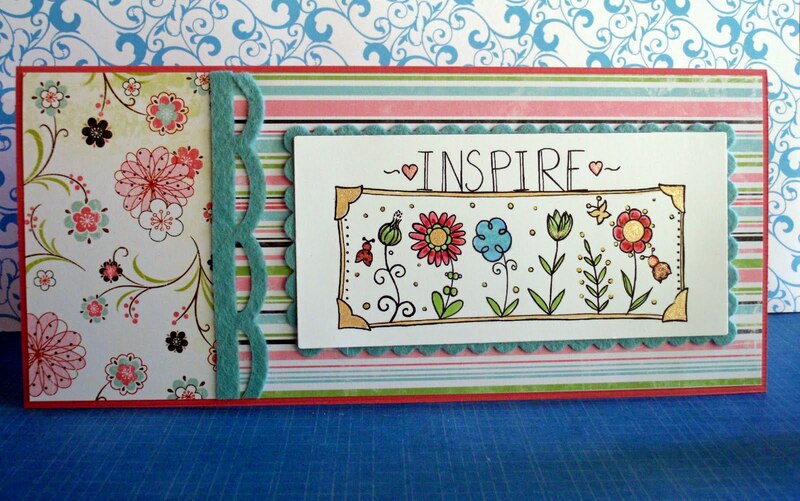 The focal image is cut with the Spellbinders Long Rectangle die and the mat was cut from felt using the Spellbinders Long Rectangle Scalloped die. I used the same felt for the little border. The die is from MFT Stamps and is the Open Scalloped Edge die. Tomorrow I'll be back with a sunshiny card for you. We've had plenty of that in Texas this summer! your things are so cute! I also love the digital stamps. And coloring them with the copics... My favorite thing right now!